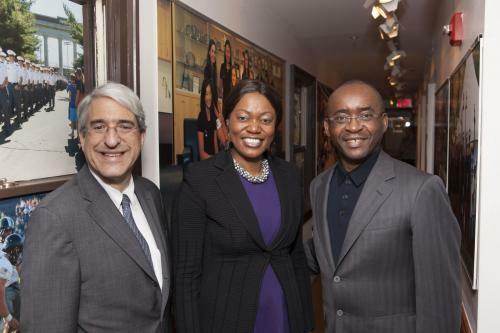 New Haven, Connecticut — Yale University and the Higherlife Foundation are pleased to announce a commitment to extend the Yale Young African Scholars program (YYAS) for another five years, made possible through the continuing generosity of Zimbabwean-born philanthropists Strive and Tsitsi Masiyiwa. Building on the success of Yale’s initial three-year partnership with the Higherlife Foundation, this next phase will see an even greater and sustained commitment by the Higherlife Foundation to further YYAS’s goal of training and mentoring the next generation of African high school student leaders. Thanks to this support, over the next five years YYAS will continue offering a free academic and enrichment program that helps high-achieving, low-income African youth prepare themselves for college and university. By the end of summer 2018, the Higherlife Foundation already will have supported 900 African high school students to attend YYAS. In addition to learning from Yale faculty, students, and staff during the summer sessions, YYAS participants become part of a robust mentorship network in which they are paired with local partner organizations, who help advise them throughout the university application process. A signature program of the Yale Africa Initiative, YYAS is modeled on and administered by the Yale Young Global Scholars program. The Higherlife Foundation was founded by Mr. and Mrs. Masiyiwa to promote basic education among thousands of disadvantaged children and to support youth talent development by offering scholarships to gifted students across Southern Africa. President Salovey and Mr. Masiyiwa will participate in a town hall at the University of Ghana at 10:30am EST (2:30pm GMT) on Tuesday, March 13, 2018, entitled “The Power of Partnership: Strengthening Education,” where participants will be discussing YYAS as well as other impactful educational programs across Africa. A link to the Facebook Live stream will be made available here: http://bit.ly/AfripreneurTalk. For more information, please contact african.scholars@yale.edu or visit YYAS online. You can follow YYAS on Twitter and Facebook to stay up to date on all program news and announcements.